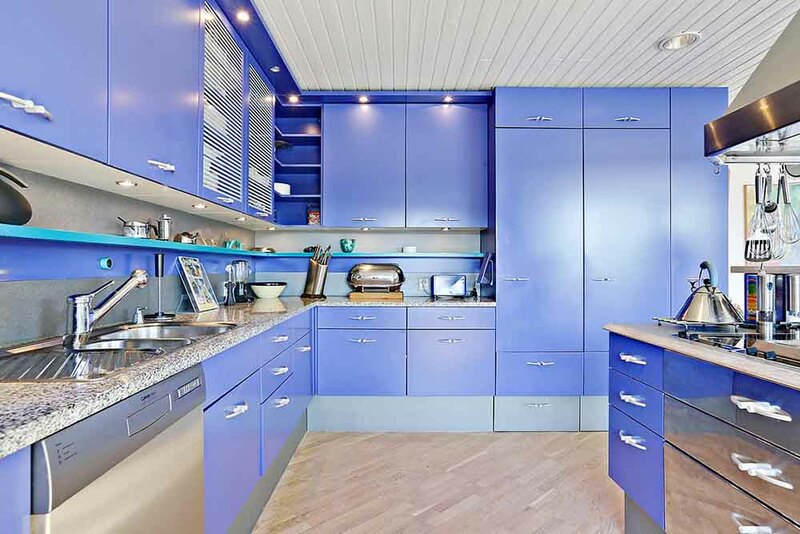 Amazing Ideas With Blue Color To Redecorate Your Kitchen. 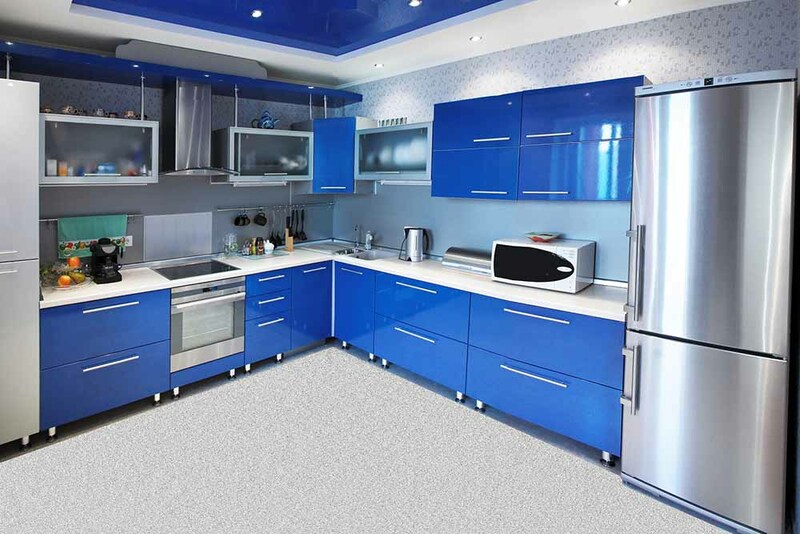 Blue Kitchen – Blue is among the favorite colors of most people. 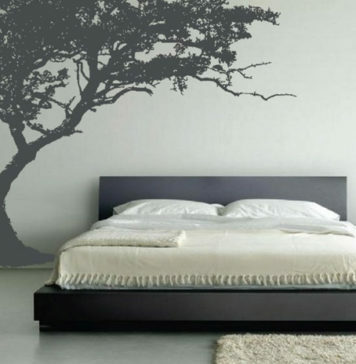 The color instills a deep feeling of peace, tranquility, confidence and trust. No wonder corporates extensively use this color in their attires. 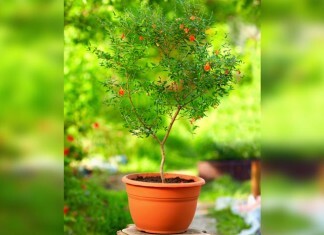 Moreover, it is the evergreen and perhaps most used color when it comes to fashion. 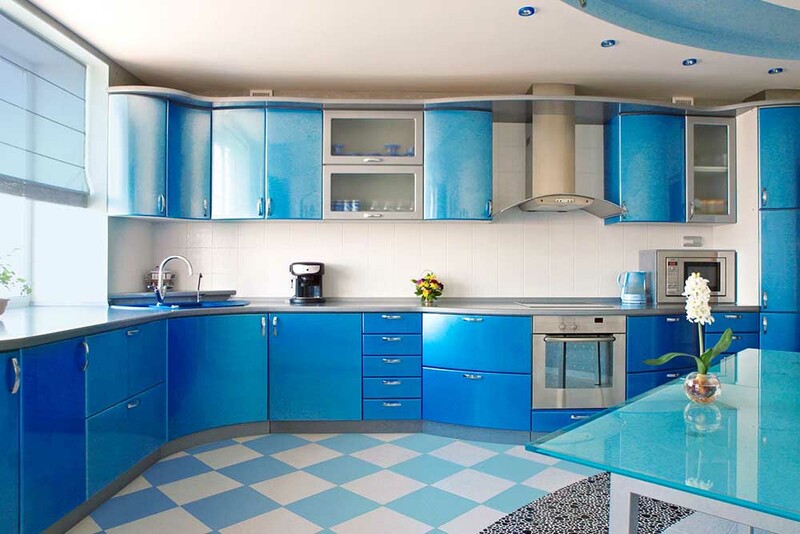 In addition to fashion outfits, blue is also widely used in home decor. 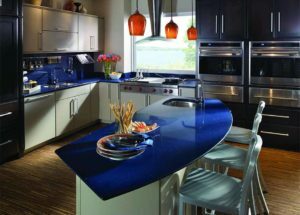 The color can particularly enhance the look of your kitchen. 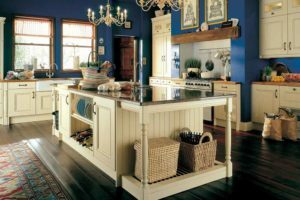 For people who love cooking, kitchen is a temple. Kitchen is not just a place for the art of cooking but also a place where you can find solace in preparing delicious food for yourself and family. 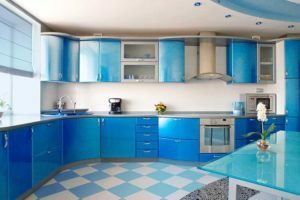 When it comes to using this blue color in your kitchen, there are variety of ways in which you can use it to turn around the look of your kitchen and dining area. 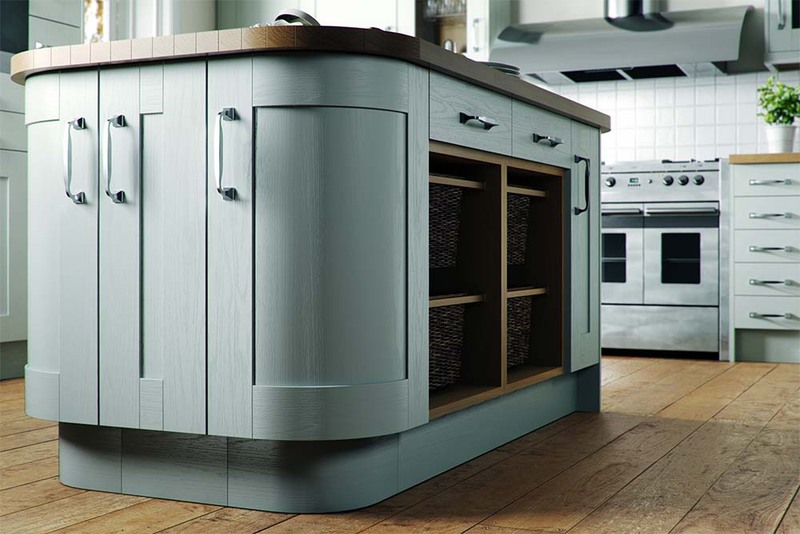 Give your kitchen a contemporary style through this wood plated, light blue kitchen design. The additional facility of cabinets makes this an ingenious way to incorporate class with functionality. 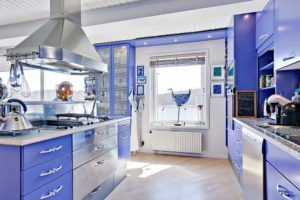 The eternal combo of blue and white make this kitchen your personal place of peace and zen where you can devote yourself to the art of cooking. 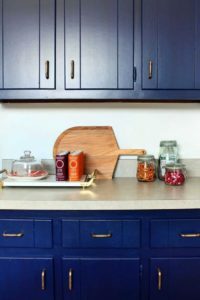 The splash of wooden color totally add an altogether different charm to the kitchen. This one has Prussian blue cabinets in the white kitchen. 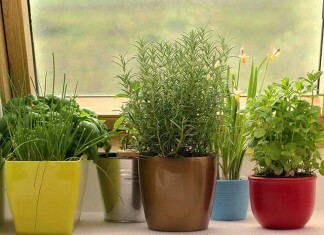 The cool colors instill a sense of deep warmth and tranquility to the place. The wooden stools present an impressive contrast with the surroundings. 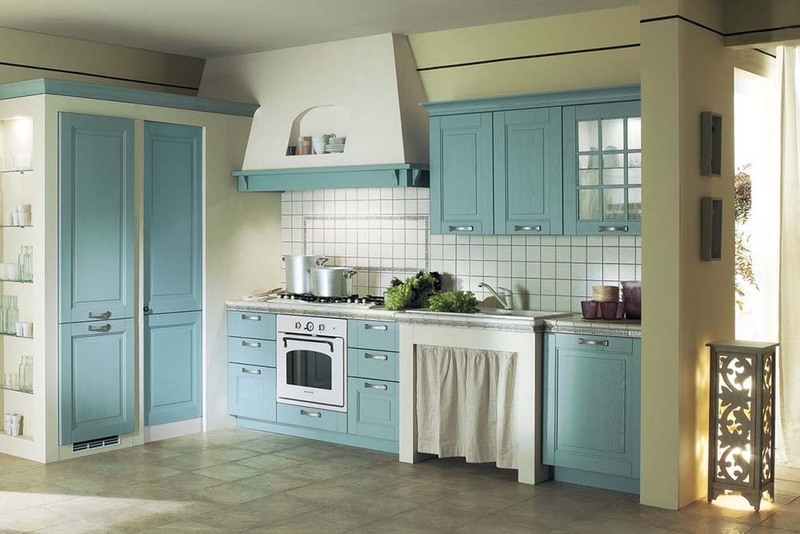 The radiant light blue color of this kitchen complements the blue kitchen accessories in a beautiful way. 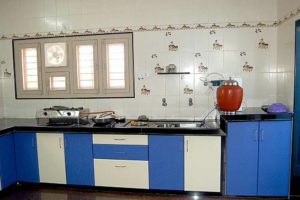 You will get many pats on your back for having this design of your kitchen. 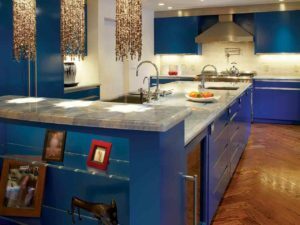 Yes, the one word that comes to mind on seeing this blue kitchen is- Magnificent. 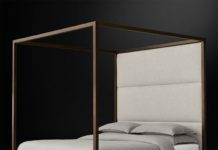 An uber cool design with a touch of modernism and elite, perfect with the lavish interior of your house. This one has a great bluish texture along with wooden cabinets. The different shade of modern chimney than the rest of surroundings adds a novel contrast to the overall place. The white chandelier in this blue white kitchen is an unusual but brilliant addition to the place. It mainly enhances the white cabinets at the back and bring out the white color in prominence with blue walls. 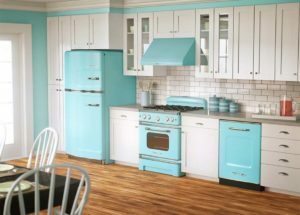 This kitchen with sky blue cabinets and wooden tops is an ideal way to give your kitchen the look it deserves. Notice the brick design at the back which is guaranteed to add a cherry on the cake. 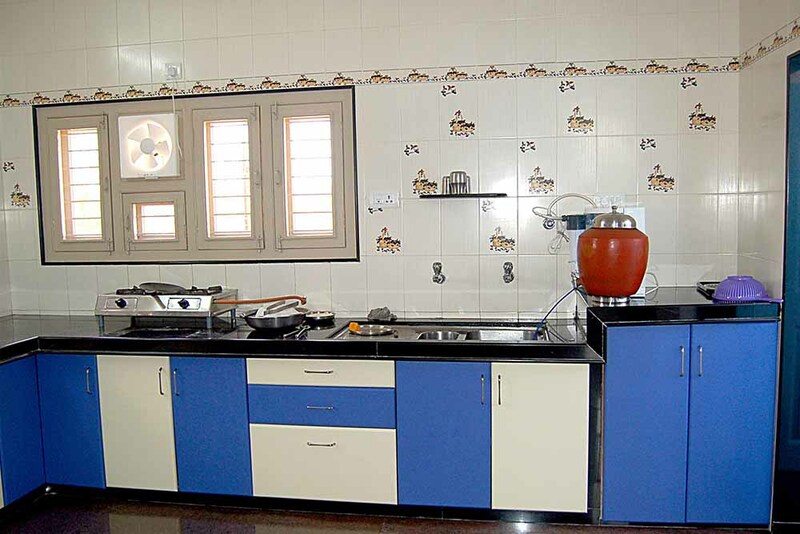 If you dream to have a royal kitchen, look no further than here. 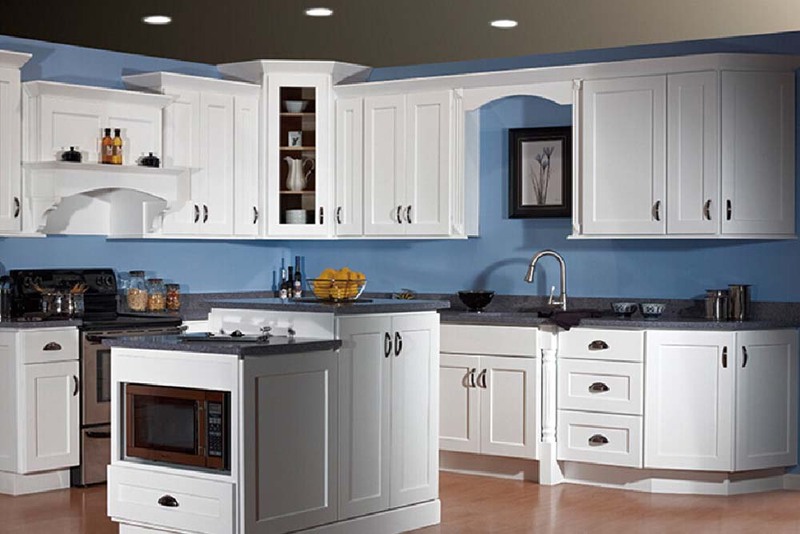 Perfect blue walls with cream cabinets are just breathtaking. Plus, the decorative piece of chandelier on the above is an incredible stroke of design. Silver knobs on navy blue cabinets are purely eye grabbing and splendid in this elegant kitchen design. 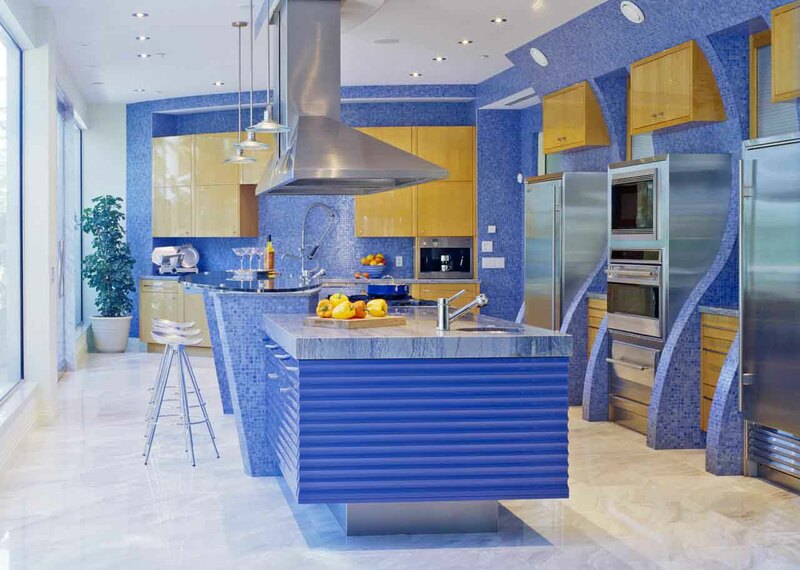 The transparent showcase of crockery is another masterpiece in this ideal blue kitchen. You will love to cook in this refreshing blue kitchen with a glossy finish. 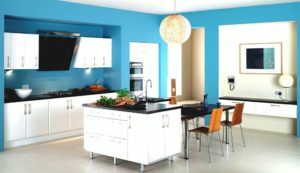 This is also perfect to place your modern kitchen appliances which will only add to the cool quotient of this kitchen design. When it comes to elegance, nothing can beat simplicity. 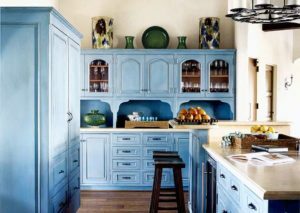 The uniform light blue shade of this kitchen not only looks breathtaking but also add a peaceful vibe to the entire place. 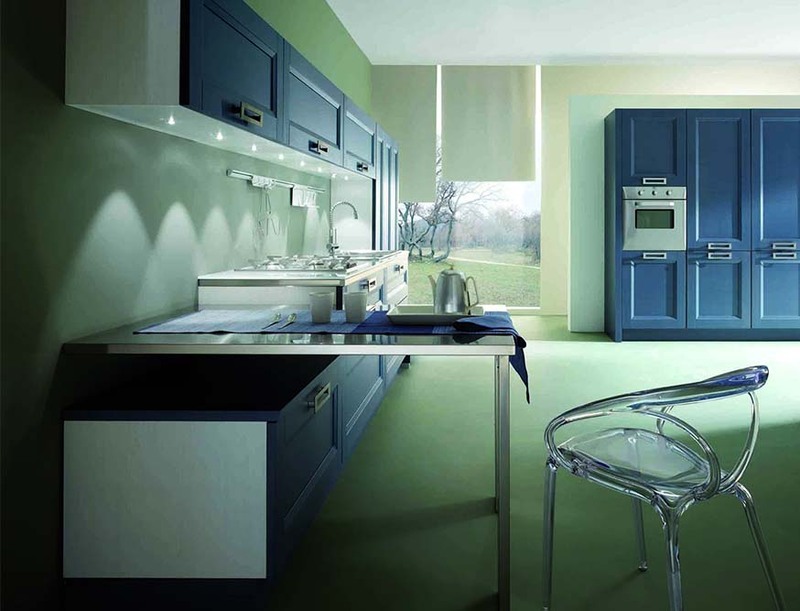 Notice those pots adding a gorgeous greenish tone to this blue kitchen. 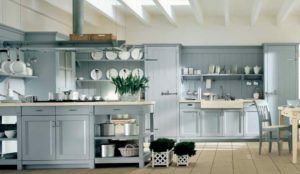 There is much more to this kitchen than what meets eyes. 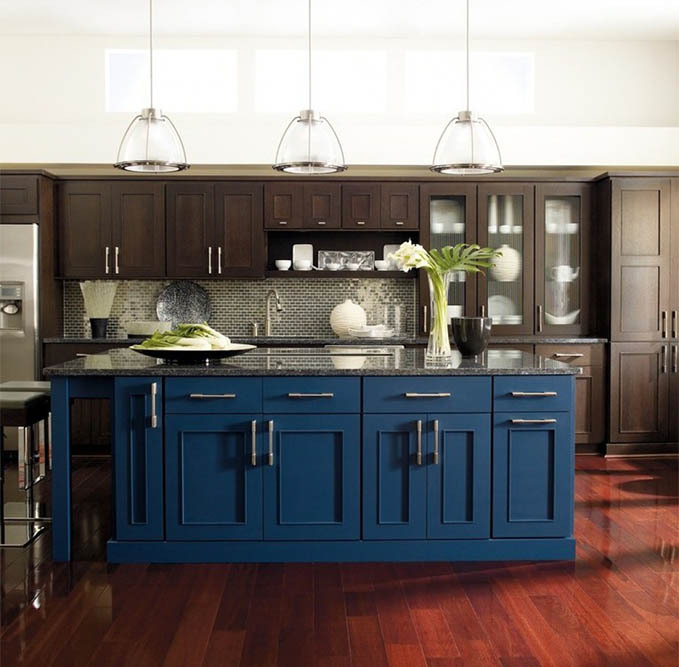 The shiny black tops with bright blue theme and white cabinets make this kitchen a treat for eyes. 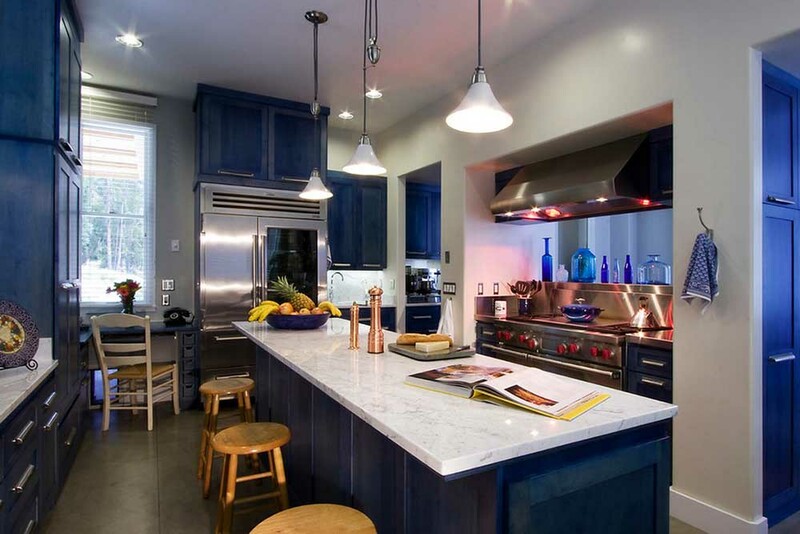 We are sure people will go gaga over your design selection after seeing this kitchen. Another classic combination of blue and white, this time with a glossy marble finish on the counter top! This blue white kitchen has even used both colors in giving a unique design to kitchen cabinets. 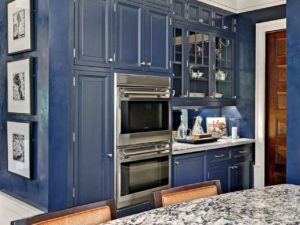 The faded sapphire blue kitchen is quite pleasing to the senses. 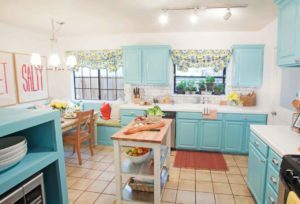 The design is not at all flashy and combines simplicity with usefulness to give an requisite look to the familiar light blue kitchen. Transform your kitchen with wood flooring and a hint of blue with white walls and cabinets. 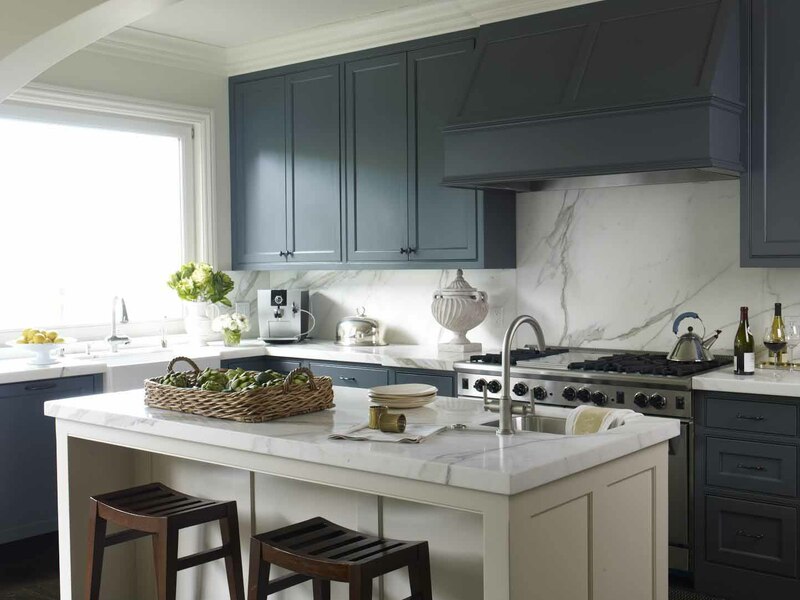 Using white chairs in this setting will further enhance the look of this classic blue white kitchen. You cannot go wrong with this royal blue theme kitchen. 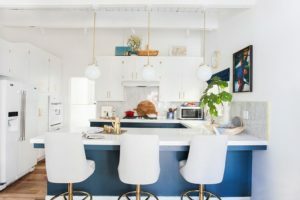 This looks straight out of a professional designer kitchen complete with symmetrical blue cabinets and a small central pendant lamp above the white dining table. 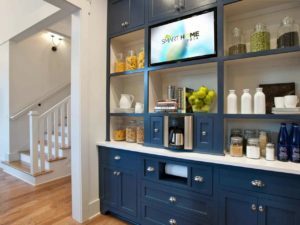 You will rarely find a kitchen design with a ready made provision of smart TV. 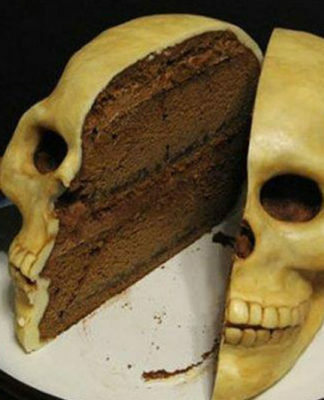 So, you can easily experiment in the kitchen by watching Gordan Ramsay in Masterchef. This is perhaps one of the best designs in this collection. It is sleek, modern, stylish and with a glossy finish sure to dazzle your guests. Add to it, the bar style stools which takes this kitchen design to an altogether different level. Nothing can beat the power of blue and white combination. Here white cabinets are used in conjunction with light blue walls.There are hanging lampshades and a splash of white on few cabinets. 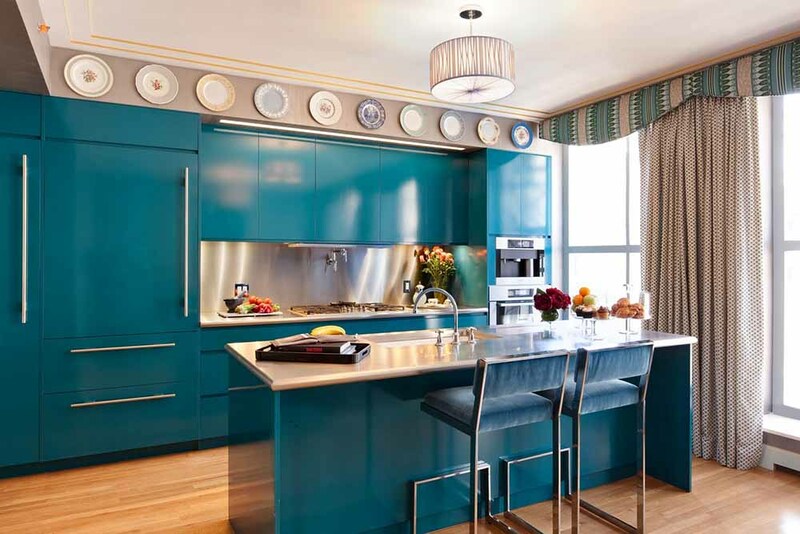 The varied color choice in this kitchen will add a spice to your mood as well as food. 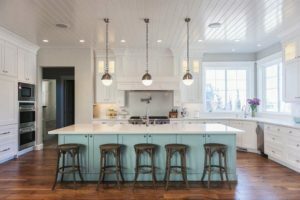 The bright yellow-green hanging lights overhead in this kitchen are simply superb, don’t you think? 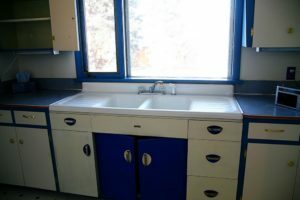 The kitchen has blue cabinets with a touch of white here and there. 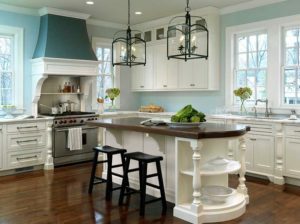 However, those soft brown walls along with a dark brown cabinet in the corner makes this a refreshing amalgamation of modern and traditional. Add a touch of photos and memories to your kitchen with a provision of photo showcase in this bright blue kitchen. Plus, those hanging golden pendants are a pure beauty! 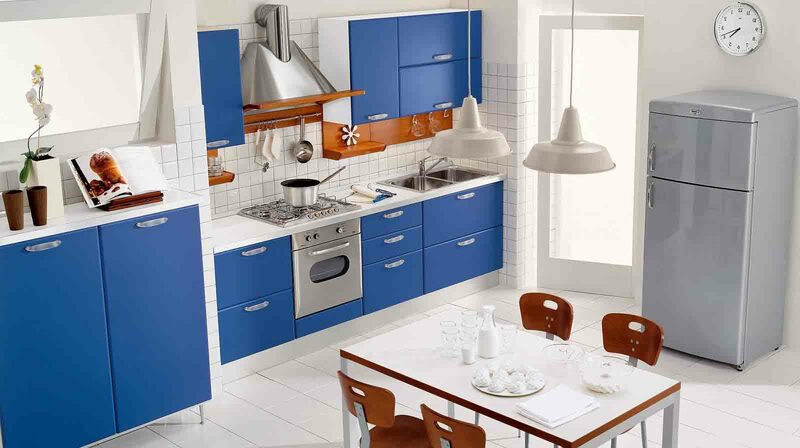 This blue modular kitchen is perfect for your urban apartment complete with all necessities. Observe the alternative use of white and blue color in kitchen cabinets which is absolutely ingenious. Transform your dining area and make it a place of relaxation and bonding with your family. 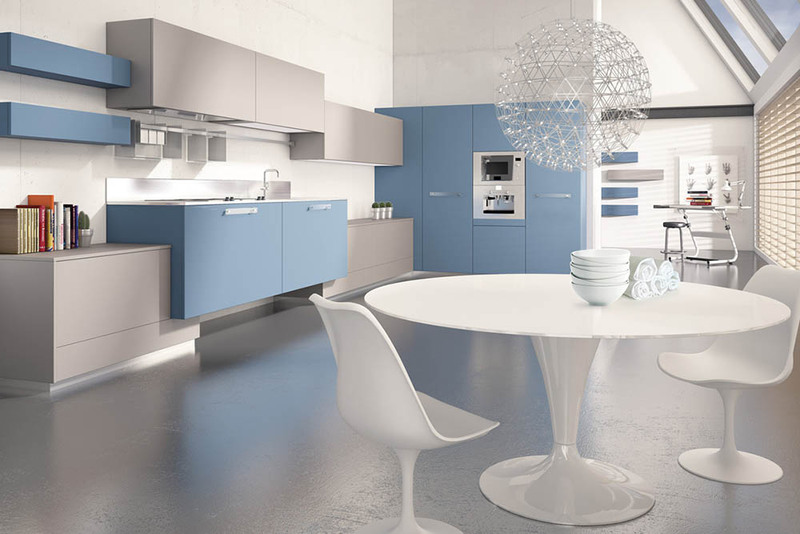 The tranquil sky blue color with an overall white theme add a zen-like vibe to your kitchen. 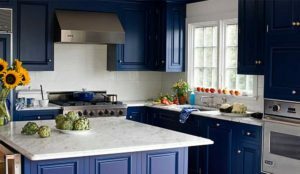 You can enhance your usual blue white kitchen by using different shades for tops. 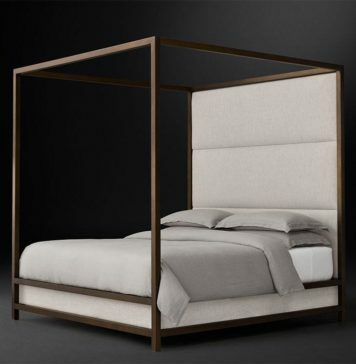 Like in this design, you will find an innovative use of graphite and wooden top separately. 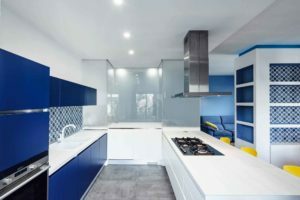 This gives a unique touch to the white theme with blue kitchen cabinets. 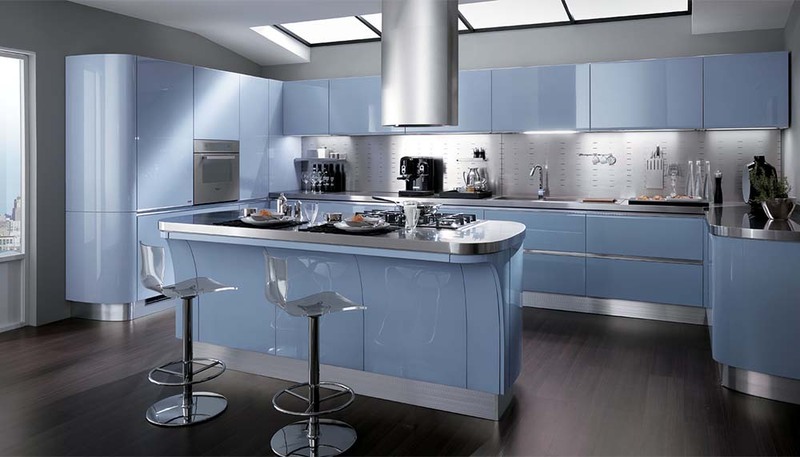 You are going to love this laminated design with a pale blue color theme. The splendid view of this kitchen looks nothing short of perfection and straight out of your dream kitchen. 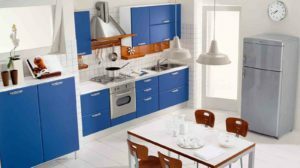 A beautiful blend of fresh and contemporary, this kitchen boasts of the triple color combination of blue, white and brown. 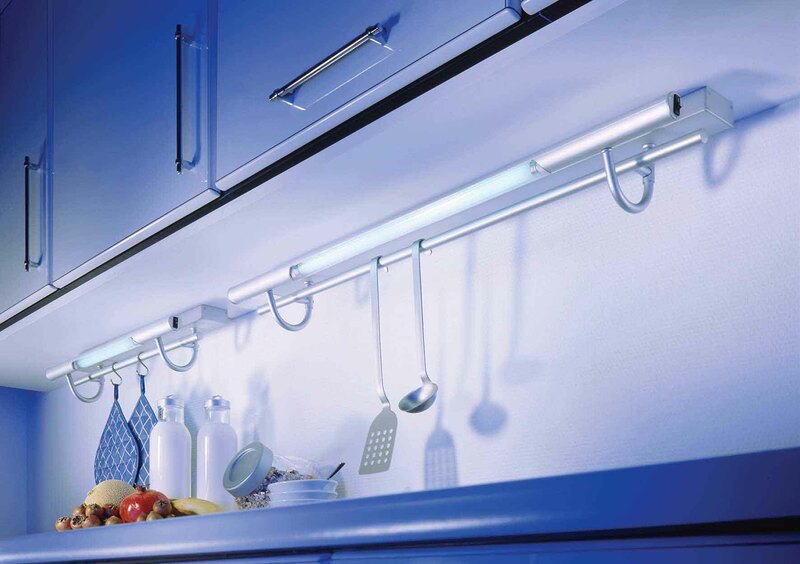 Moreover, you will agree when we say that this trinity works wonders in changing the look of your kitchen. The cold blue splash on walls with white cabinets in this kitchen add an undeniable sense of beauty and perfection in this design. 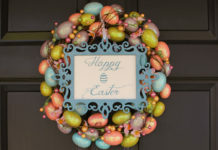 You will not be able to resist the charm of the ingenious use of round decorative balls. 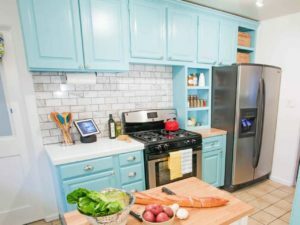 This one may look like bit cluttered at first glance but you will love this inspiring idea for your small kitchen and dining area. 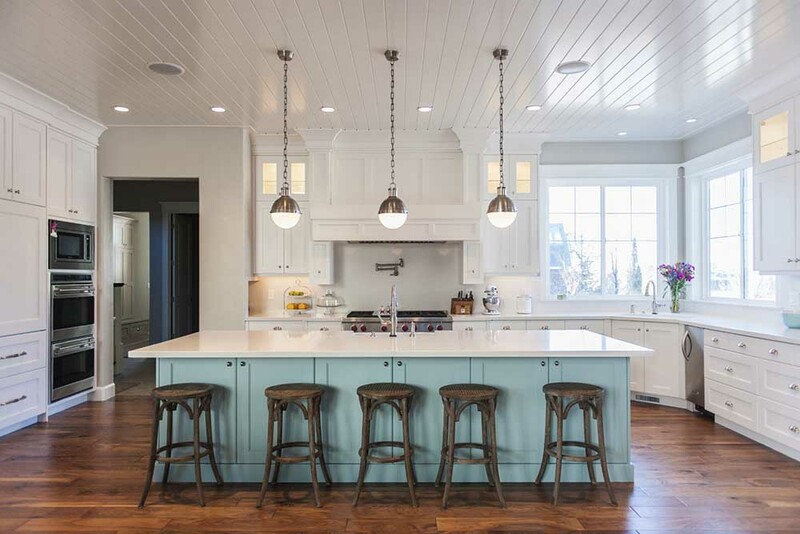 The use of different shades of radiant blue with brown stools is beyond any words of praise. 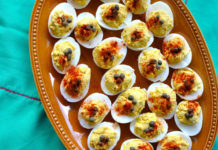 Want to do more than just cooking and eating in your kitchen? Then have a look at that book arrangement in this minimalist blue white kitchen theme. 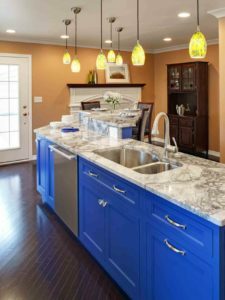 You cannot ignore the stylish pendant lighting over the tabletop in this excellent blue kitchen design. 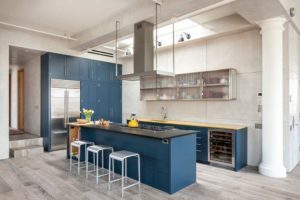 This one is a bold and courageous experiment with midnight blue color. 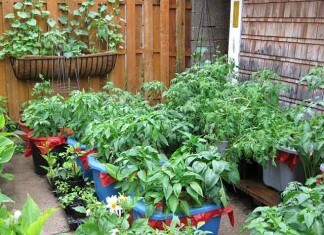 And, as you can see, the experiment succeeds in a spectacular way by completely overhauling your small kitchen space. 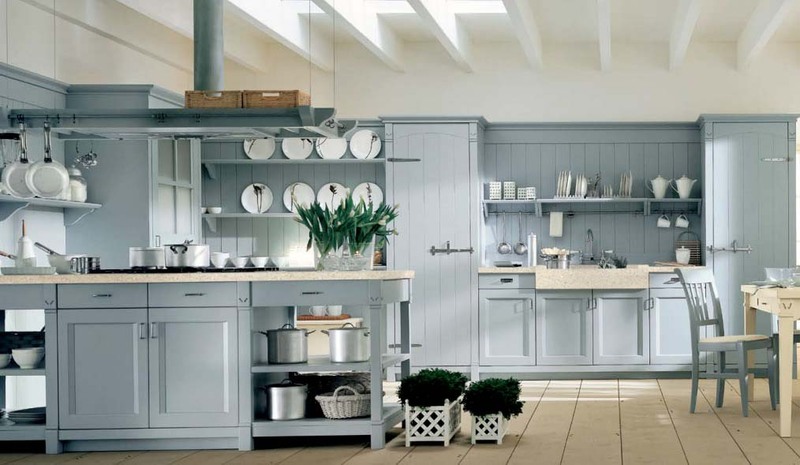 A symmetrical and sophisticated design which incites emotions of calm and peace whenever you enter your kitchen area. This is purely an artist’s kitchen with shades of wood amazingly combined with a rustic touch to the blue color. 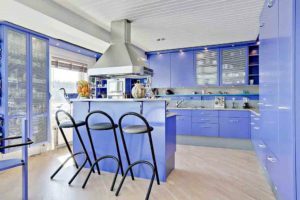 The black kitchen top adds another icing on the cake of this different blue kitchen. 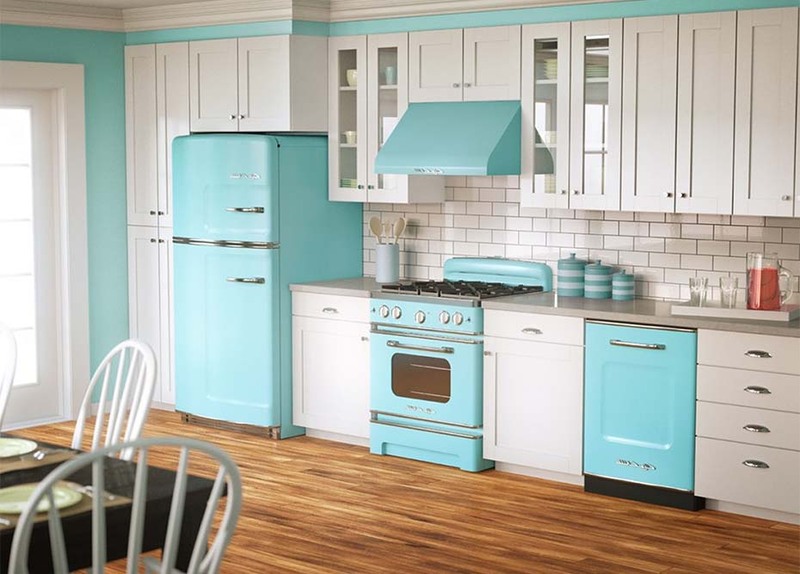 The use of classic blue color has rarely been more simple yet classic. 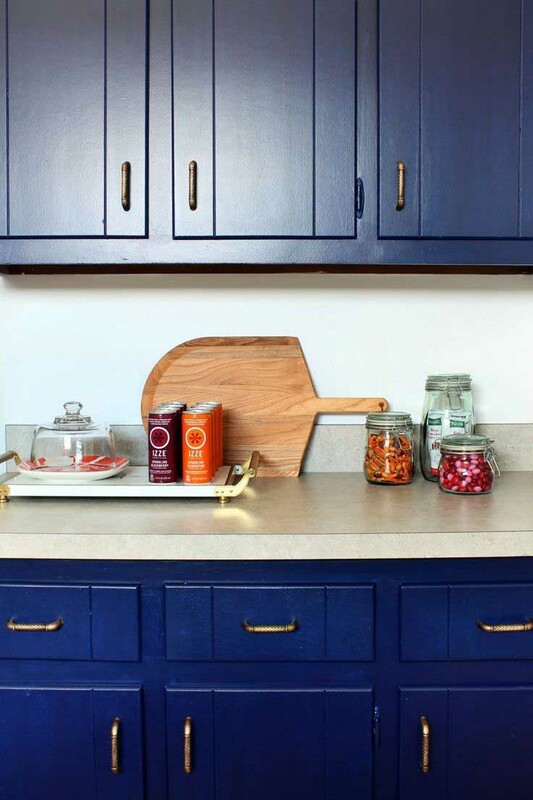 Adding to the charm are golden handlebars on blue kitchen cabinets. 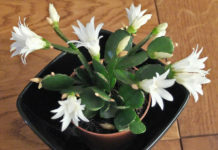 The white area in middle completes the look in an elegant way. You can see a creative use of antique stools and light blue color in this predominantly white kitchen. Three hanging lights supported by metal chains enhance this lovely blue kitchen decor. This one is a splendid blend of antiquity and modern classic. The use of see through cabinets with old containers at top matches with the cool blue theme of the kitchen. Wooden stools in the area are another nice addition to the setting. 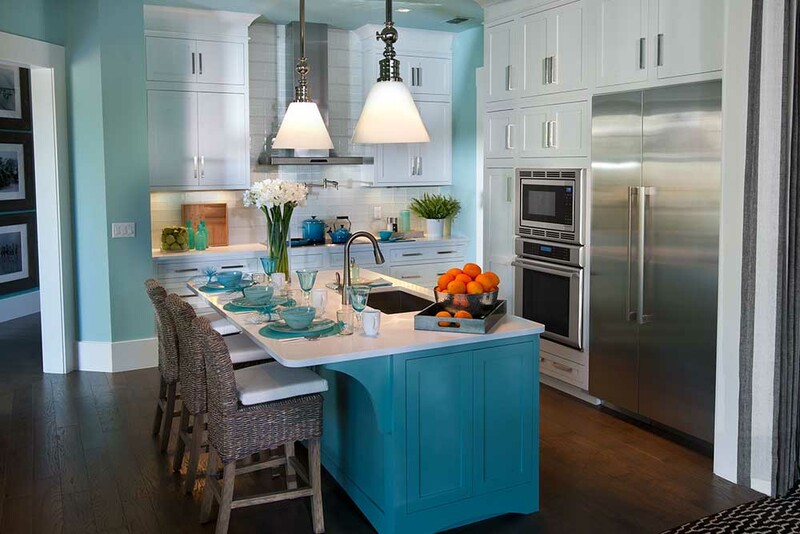 The dark shade of aqua blue color with silver knobs forms a lovely base theme of this blue kitchen. However, one has to look at the bold use of pink color in the stylish stool to fully appreciate the magnificence of this design. 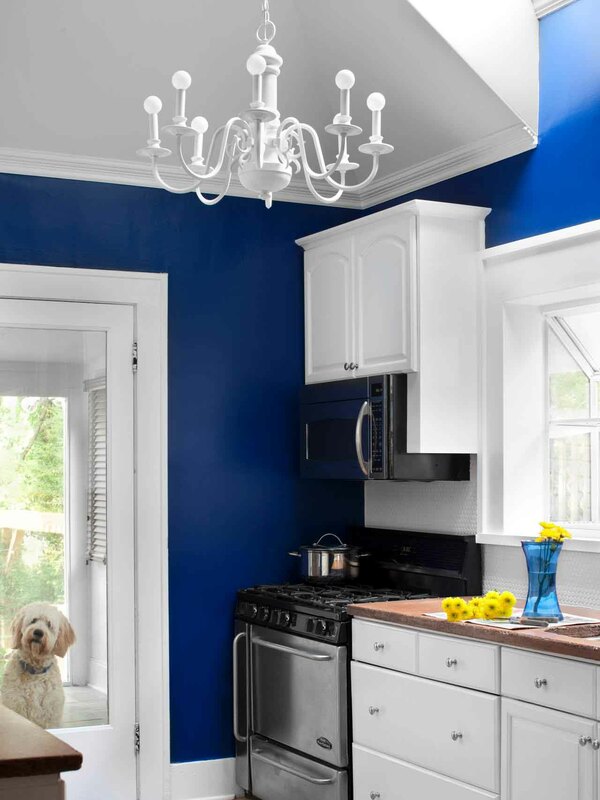 What a brilliant use of black color with trademark blue white kitchen! The use of black stools and black lantern is simply a masterstroke. The wooden top in the center further enhances the overall look of this kitchen. Minimum experimentation, maximum effect. 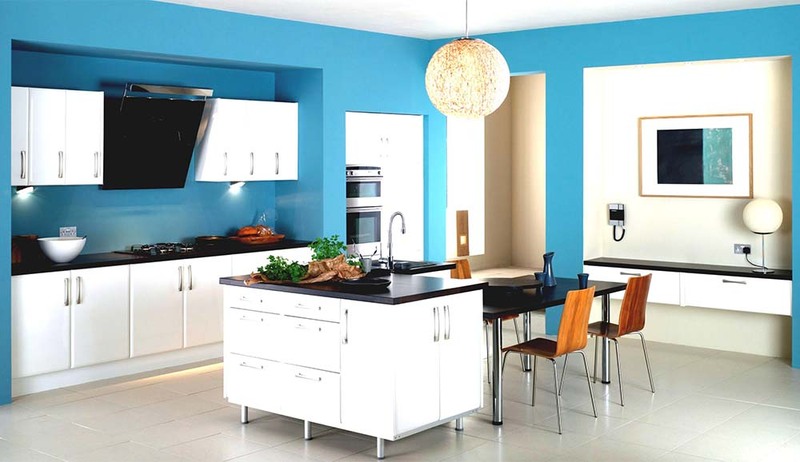 If you want to go with tried and tested blue white combination for your kitchen, try this refreshing layout. The design is not only visible on the walls and cabinets but also on floor making it an ideal inspiration for your kitchen. 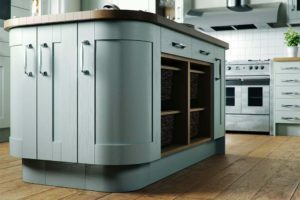 This one is another innovative design which has totally changed the look of traditional white kitchen. 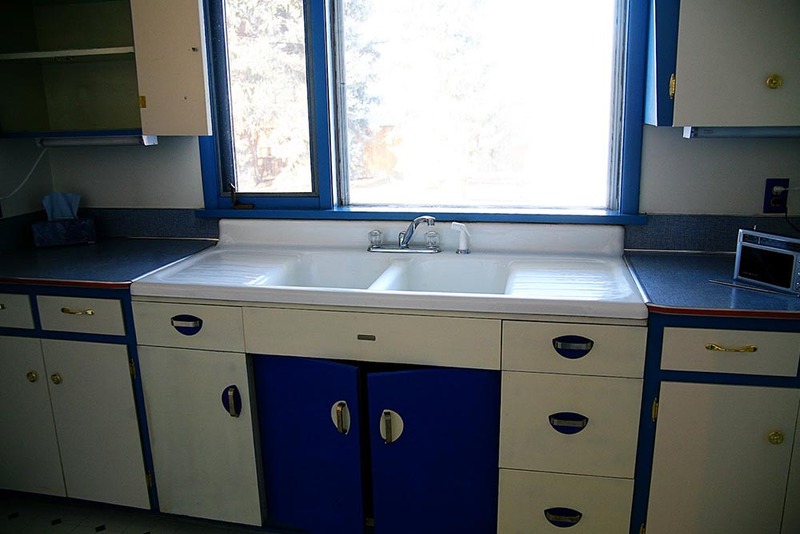 You will see a few blue cabinets in the middle. However, brass base of white chairs is what sets this design apart from others. 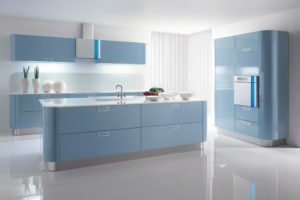 Sky blue is one of the evergreen shades of blue which is quite soothing to senses. 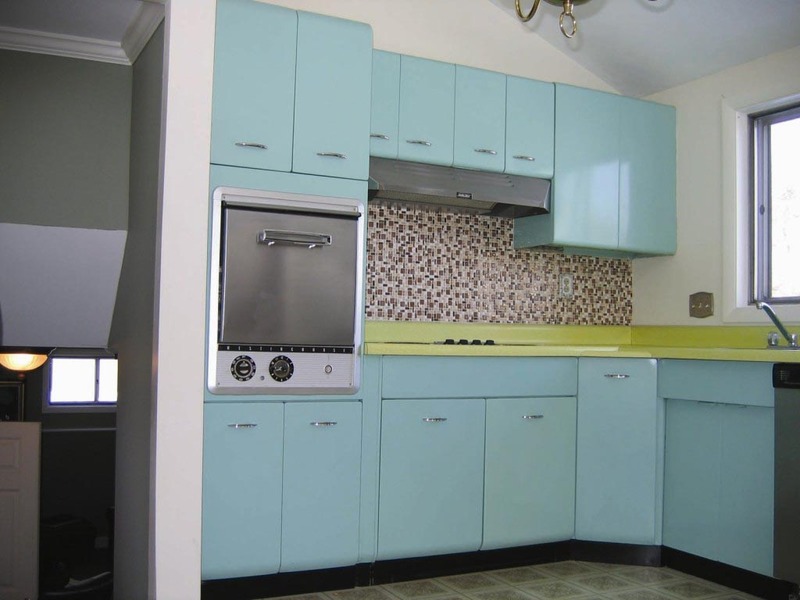 These kitchen cabinets make a perfect use of that aura of sky blue. 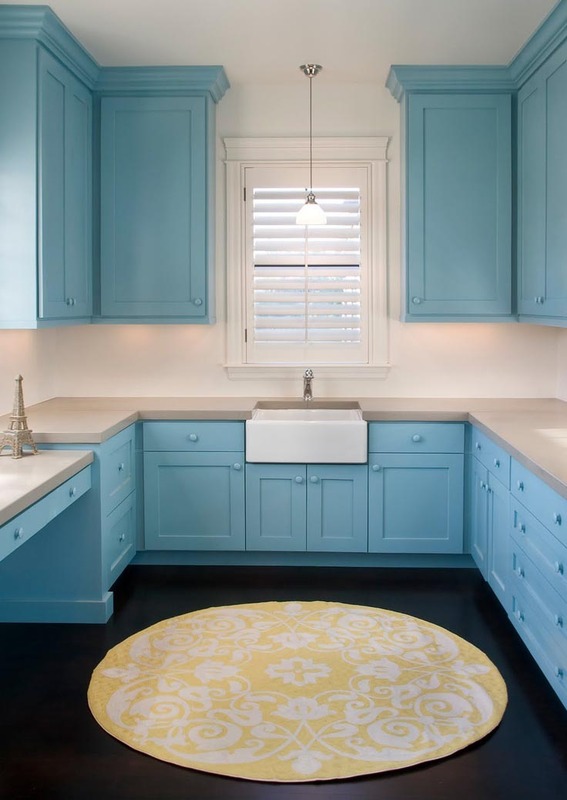 And one must give a credit to the designer for using this color in most simplistic manner to transform the kitchen. The vibrant turquoise color along with white cabinets gives a refreshing feel to this blue kitchen. The use of matching crockery on table is further enhancing the look whereas hanging overhead lamps complete this creative design. 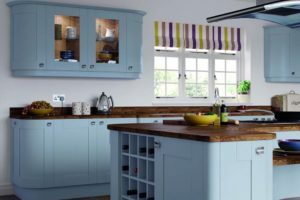 The designer has done away with all the main corners of this kitchen and we have to admit, the results are superb. 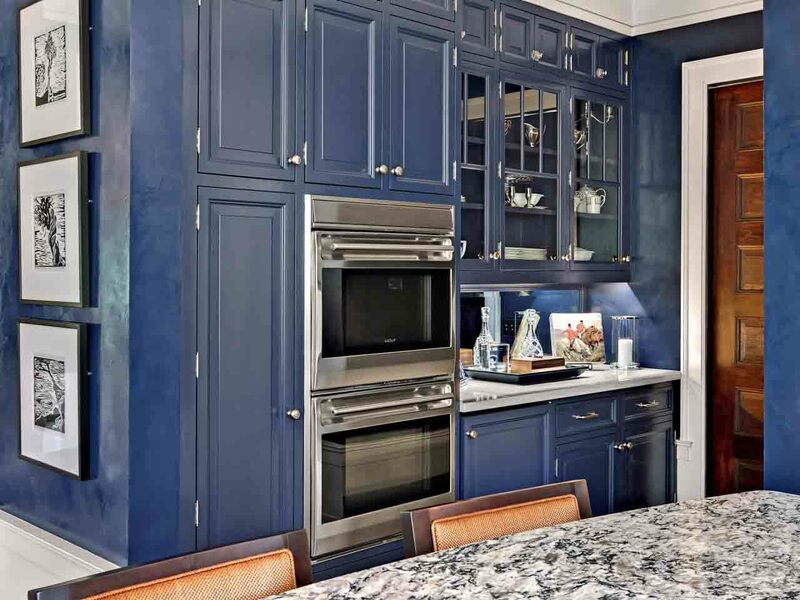 This blue kitchen has rounded corners along with blue see through cabinets. 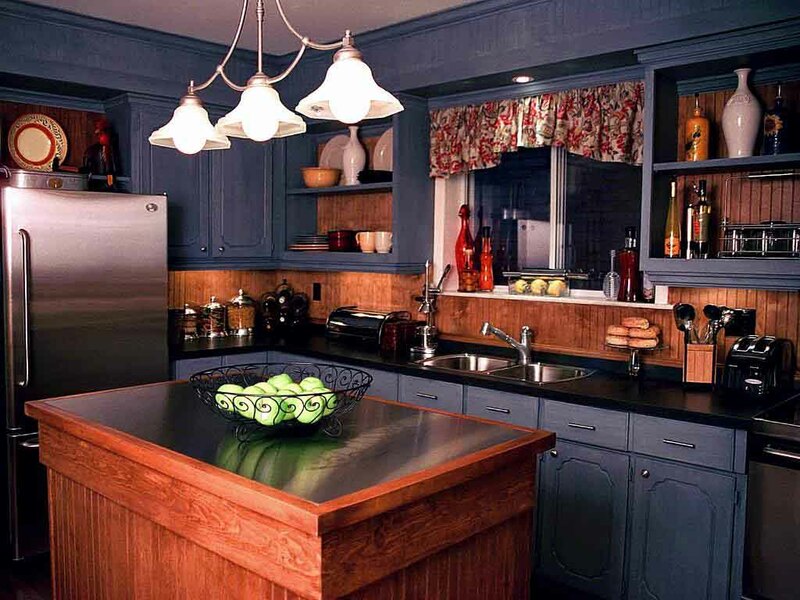 The wooden tops all around the kitchen form an excellent addition to this unique design. Add a glamor quotient to your kitchen with the use of peacock blue color- one of the most attractive blue shades. 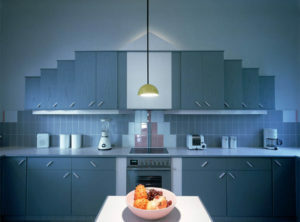 You can also showcase your crockery on a top shelf which will give a different outlook to your kitchen. 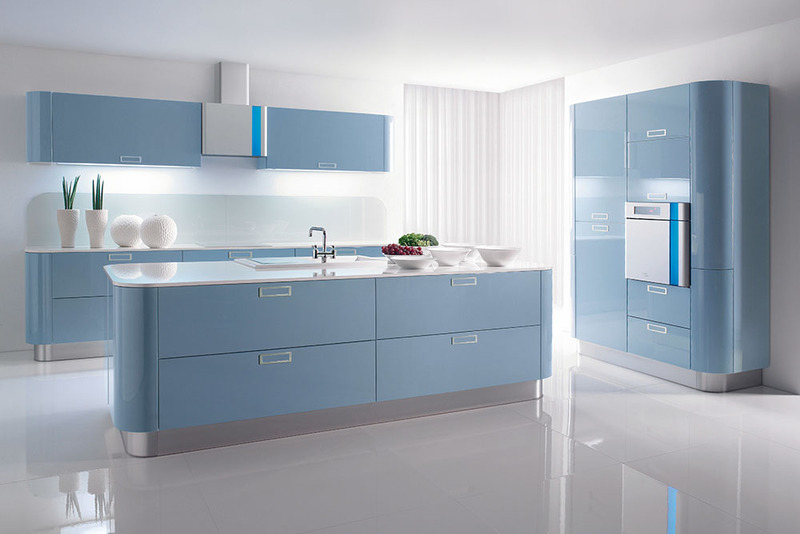 This one is a perfect contemporary design for your modern kitchen. 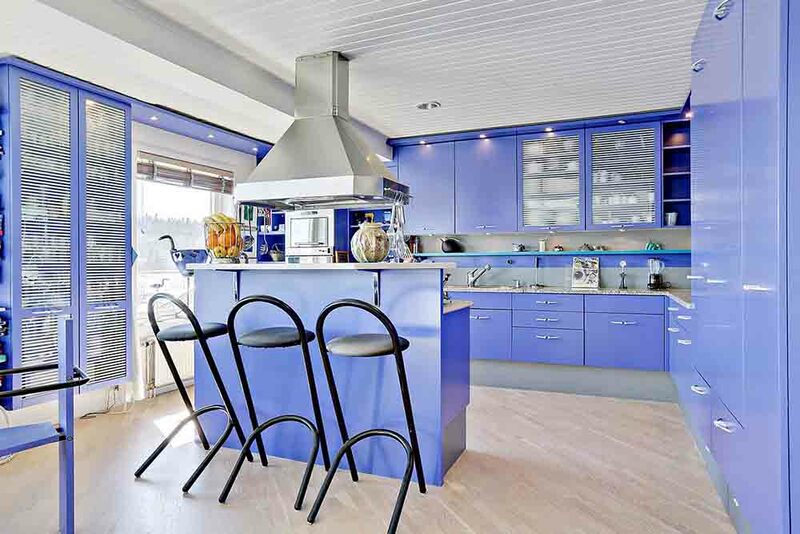 The light shiny blue shade with stylish stools is sure to impress your guests and invite some envious looks. Totally worth it! An elegant design with superior blue shade choice makes this one a truly spectacular design. The modern chimney perfectly complements the chic feel of this kitchen which will make your cooking experience an unforgettable one. 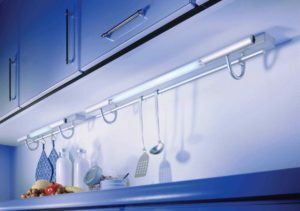 LED plinth light fitted alongside the counter dazzles the look of this blue kitchen. 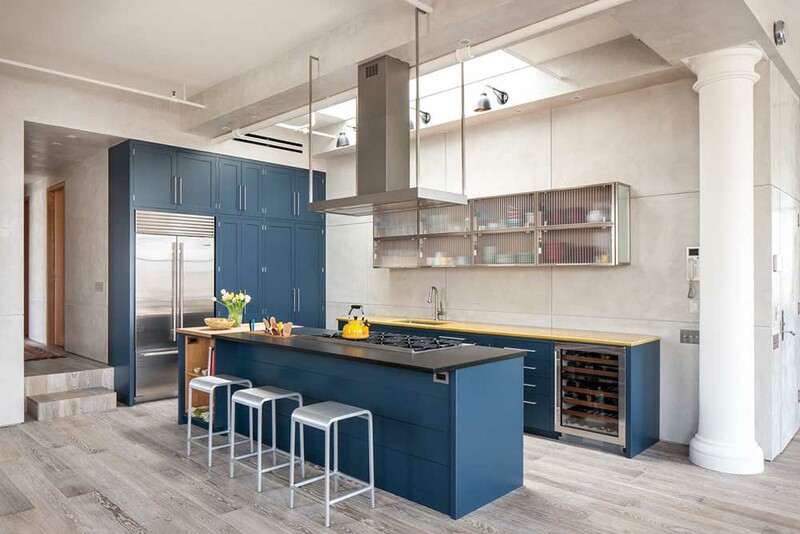 The designer stool enhances the overall urbane feel of this kitchen. 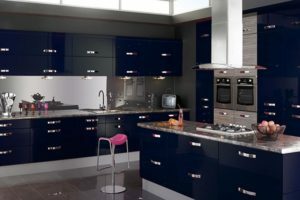 This may have a somewhat flashy appearance with a glossy blue design but you cannot deny that it looks fantastic. The stainless steel sink and crockery are further adding to the elan of this superb blue kitchen interior. We are sure that you will find these excellent ideas immensely beneficial to transform the look of your blue kitchen. 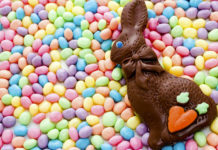 Which one of the above is your favorite? Tell us about it below.